As eels only breed in the ocean, the Sargasso Sea. They have to migrate down the rivers of Europe and enter the sea. This downstream return migration is characterised by blocked migratory pathways. The 25,000 Hydropower Stations, the numerous water management and pumping stations and blocked waterways all combine to make this journey extremely hazardous and in some places impassable. Where Coastlines are heavily defended in the name of coastal and flood defence and the use of hydropower as a renewable source of energy is irriversable. 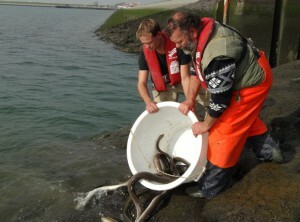 Waterways in the habitat of the eel and the use of freshwater systems have changed dramatically during the last decades it has been decided, to not only restocking with young eels to get them into freshwater but also to help the elders escape out over the barriers. This is a process of catching or trap them and transfering them over the barriers. Tens of thousands of them are saveguarded and so helped on their return journey to their spawning grounds. As long as migratory pathways are blocked Trap and Transport is a very helpful temporary or emergency measurement. Eels need the help of mankind as long as technical solutions to unblock the pathways are not in place. ESF is helping out with knowledge and co-finance the help that is needed.